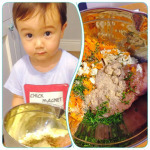 MY RECIPE BOX: red velvet cake | Beverly's Net: family. food. fashion. 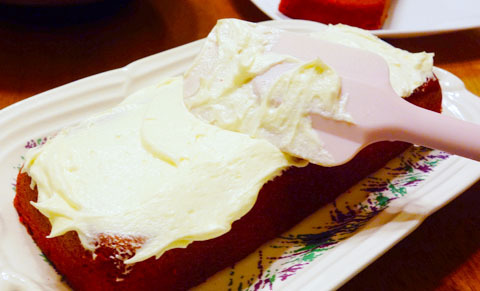 MY RECIPE BOX: red velvet cake – Beverly's Net: family. food. fashion. I had all the ingredients (or rather, I had red food colouring) to make a Red Velvet Cake for months, but never got round to doing it.. thinking it’d be fiddly and difficult and I’d need heaps of time to do it. Turns out, it was actually pretty basic! I made the cake in the evening, after putting the kids to bed. And, in between, I was writing and surfing the internet whilst waiting it for bake and to cool down, so it actually didn’t feel as effort-ful as I’d expected it to be. 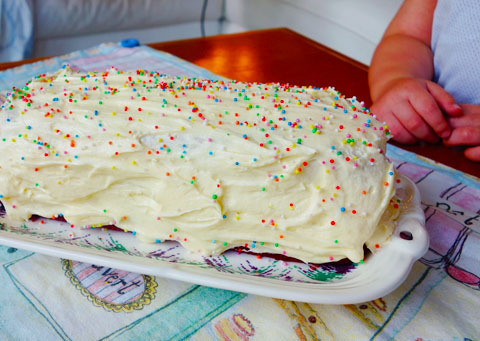 I mashed together about four different red velvet cake recipes to make mine. Except I don’t quite remember what I did… so whoops! 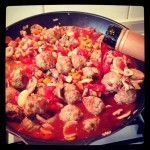 But here’s one of the four recipes I used, and it’s probably most similar to what I actually did – give or take. I used less sugar and a tad more buttermilk (to make it more moist). I baked mine in loaf tins, just so I could cut it into slices more easily later. 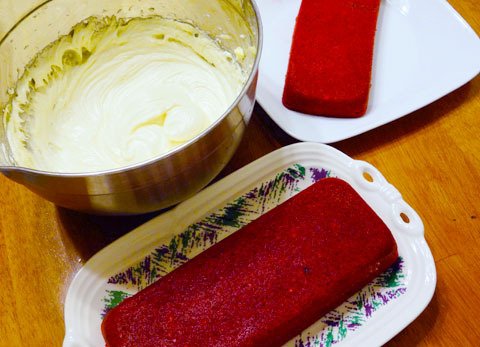 Here’s what the red velvet cake logs look like, before being iced! 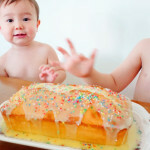 To cover up my slopping icing job, I got the kids to whack on sprinkles the next morning. They were only too happy to help!! This red velvet cake is pretty damn DELICIOUS, errrr, if I do say so myself! It’s moist, and the icing is not too sour nor sweet. And overall, it was pretty easy to make. 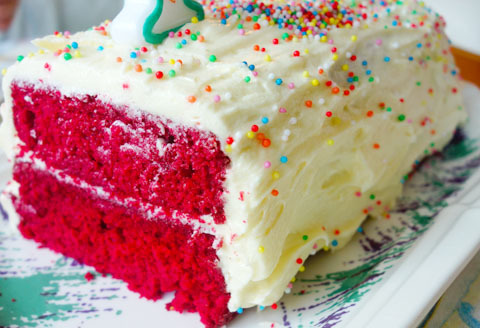 Next time I gotta make a birthday cake, I’m SO making a red velvet cake!! Have you ever tried sprinkling chopped walnut and almond on this type of cake? 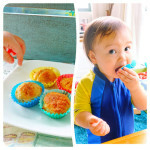 Taste heavenly and it adds more texture :). Are Hunter and Carter ok with nuts though? They’re probably ok with me.. but i’m not. I hate nuts in my cake, haha! !